This post can be considered a dated post, it's no longer an excitement to other Wind lovers, though it might be another selling point of Wind for new potential buyers. I should have done the "turbocharge installation" much earlier, but aiks, it's just hard to squeeze more time everyday especially if need to work even during night! Cool huh? ;) Yeah, it's the official BIOS update from MSI, not the leaked BIOS I talked about in the previous post. 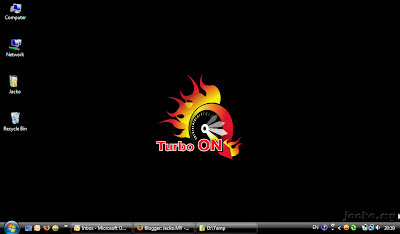 Very simple to install this "turbo engine" onto your Wind. First, download the latest v1.09 BIOS from MSI download page. Second, follow this link to prepare a bootable USB drive, and finally follow the user manual attached in the BIOS file to complete your update. 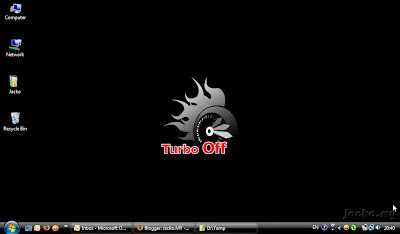 Once enabled, boot into Windows, press Fn F10 to try the turbo. And yes, you must have power plugged in to enable the turbo function. On contrary, you will enable different ECO modes if you press Fn F10 when on battery. Here's the result with 24% turbo, meaning the Atom CPU has been boasted from 1.6GHz to 1.984GHz! I am running the display card driver from Windows Updates. I believe the Gaming Graphics section could be further improved if I update it with Intel's OEM driver. A slight improvement of 0.1 on disk transfer rate after I enabled AHCI mode. You can read the wiki on what is all about AHCI. If you are running Vista on Wind, make sure you follow this article before you enable it. I still can't find any netbook in the market that could beat Wind in term of performance, perhaps the closest contender is Asus Eee 1000 series. With so much improvement releases from MSI, I just feel my $$ is worthwhile with this investment. Of course there are many OC software can be used to achieve the similar, but it's similar to car modification, whether your car (OC) is street legal or it's not legal to be on the road. With official support from MSI, don't you feel more comfortable to OC?